Change things up with these side-trips from Ahmedabad: Gandhinagar (Adalaj Trimandir, Capital Complex, & more), Pariej Lake (in Pariyej) and Swayambhu Sulpaneshwar Temple (in Kevadia). Next up on the itinerary: contemplate the long history of Sabarmati Ashram / Mahatma Gandhi's Home, see the interesting displays at Calico Museum of Textiles, contemplate in the serene atmosphere at ISKCON Temple, Ahmedabad, and take in the waterfront at Sabarmati Riverfront. For photos, maps, traveler tips, and more tourist information, use the Ahmedabad online driving holiday planner . If you are flying in from India, the closest major airport is Sardar Vallabhbhai Patel International Airport. In June, plan for daily highs up to 45°C, and evening lows to 32°C. Finish up your sightseeing early on the 29th (Sat) so you can travel to Winnipeg. 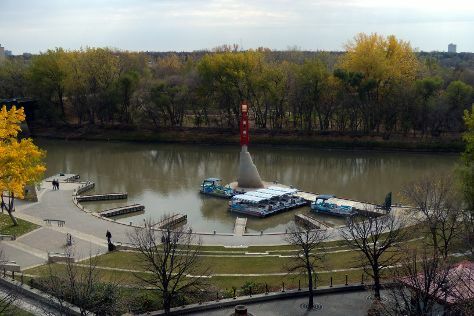 Explore the numerous day-trip ideas around Winnipeg: Portage la Prairie (Island Park, Portage Credit Union Arena, & more), Winkler (Valley Bowling Lanes & Bethel Heritage Park) and White Horse Plain Monument (in Saint Francois Xavier). And it doesn't end there: steep yourself in history at The Forks National Historic Site, look and learn at Manitoba Museum, test your problem-solving skills at popular escape rooms, and ponder the world of politics at Royal Canadian Mint. To see photos, more things to do, traveler tips, and more tourist information, read Winnipeg planner . You can fly from Ahmedabad to Winnipeg in 23 hours. Due to the time zone difference, you'll gain 11 hours traveling from Ahmedabad to Winnipeg. Expect much colder temperatures when traveling from Ahmedabad in June; daily highs in Winnipeg reach 27°C and lows reach 15°C. On the 29th (Mon), wrap the sightseeing up by early afternoon so you can travel back home.